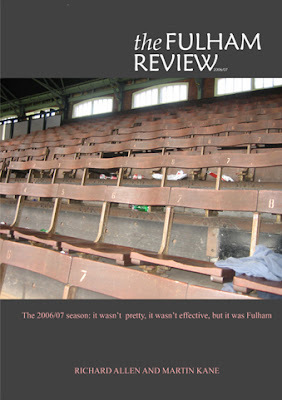 I doubt anyone reads this blog who doesn't also read The Fulham Independant or Craven Cottage Newsround but just in case I have reproduced a message below from Richard, who writes CCN, about his season review book. I've had a look at the preview and it looks very professional and well worth a read. It also has something by me in it so it has to be good! I've not really managed to write anything since the season ended and I'm off on holiday next week so for the next few weeks there won't be anything new appearing on this site. I will be posting on TFi when there's something interesting to read again, or you can subscribe to posts via the atom link at the bottom of the page, or if you're really clever you can use an RSS reader to see when something get's updated. Anyway over to Richard for the advert (nice cover don't you think?). Match reports from all the Fulham games this year, but also has the team news, referee, attendance, and basically everything you'd expect to find. Sixteen essays. There are a couple by me (on Jan Lastuvka, our best central defensive pairings, and a few topics relevant to the time), a whole series on general footballing issues by my friend Martin, one by Chopper (the longest in the book, a cracking essay on Steed and Boa) and so on. It's good stuff. Statistics. You've got a league table as it was every month, as well as final apps/gls/yellow/red cards. And so on. It might not have been the most exciting season ever but still good to look back on, right? Or not? Who knows. Anyway, you can have a proper preview here. Should this sound interesting it couldn't be easier to get a copy. We've made these as Print on Demand books via lulu.com. So you can get a copy two ways. Either a printed version or an e-book. You can download the e-book for free off the Lulu website. We want as many people reading it as possible, so we figured the e-book costing absolutely nothing might help that. But if you do like it and would like a proper, bound copy, you can buy one from lulu for a fiver. It's about as cheaply as we could do it and the book's A4 size and is 84 pages long. It looks like a slightly thicker and slightly less well produced version of one of the old Wembley programmes. So go here to see it on lulu (and buy a copy!). Lulu accepts all credit cards and also takes paypal. Or I could send you a copy in a month or so when I get my stock.We never really planned to do this until about February, but having got it done we're really pleased we did. Might not be to everyone's taste I suppose, but I reckon it's the sort of thing I'd like to read and for a fiver you can't go far wrong. We're not making money on this, the point was to make the thing and go from there. If it goes well we'll do it every year too. Hope you like it, and if you do, tell everyone you know.